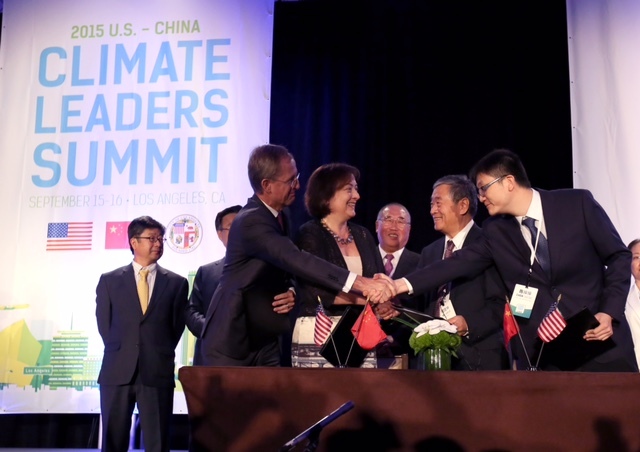 (Los Angeles – September 15, 2015) Leading research and advocacy groups from the U.S. and China signed a new cooperation agreement in Los Angeles today, pledging to work together to address the threat of climate change. Environmental Defense Fund (EDF), the Beijing Climate Change Research Centre, the Institute of Low Carbon Economy at Tsinghua University, and the Rocky Mountain Institute signed the Framework Agreement on Cooperation in the Field of Addressing Climate Change. The groups will collaborate on research, training and technology to create low-carbon eco-cities, promoting urban sustainable development while also addressing climate change. Areas of cooperation include carbon emissions trading, urban low carbon planning and development strategies, low carbon architecture, low emission transportation, energy conservation and environmental protection.